A Sedimentation Tank is a tank in which suspended solids are allowed to settle out of a liquid under the influence of gravity. Sedimentation Tanks used in sewage treatment can be for either primary treatment or secondary treatment. They are therefore called Primary Sedimentation Tanks or Secondary Sedimentation Tanks. The paragraph below describes such tanks used in the primary stage. 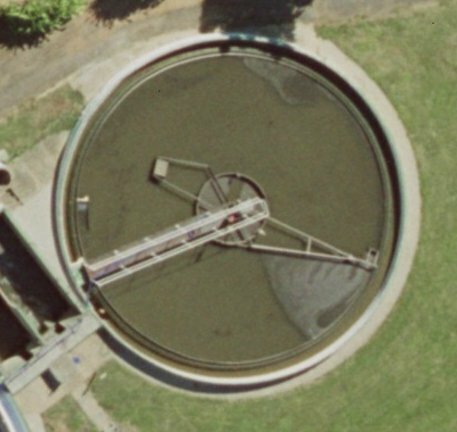 Many Wastewater Treatment Plants have a sedimentation stage where the sewage is allowed to pass slowly through large tanks, commonly called "primary clarifiers" or "primary sedimentation tanks". The tanks are large enough that sludge can settle and floating material such as grease and oils can rise to the surface and be skimmed off. The main purpose of the primary clarification stage is to produce both a generally homogeneous liquid capable of being treated biologically and a sludge that can be separately treated or processed. Primary settling tanks are usually equipped with mechanically driven scrapers that continually drive the collected sludge towards a hopper in the base of the tank from where it can be pumped to further sludge treatment stages.